As ICOM doesn’t provide any information concerning TX/RX (MARS/CAP) modifications for the new ID-5100 I investigated the detailed function of the diode matrix responsible for the localization. Due to the absence of any circuit diagram and the non-descriptive PCB I can’t tell the diode numbers – I can only show them. To get access to the PCB only the lower cover needs to be removed (8 screws). 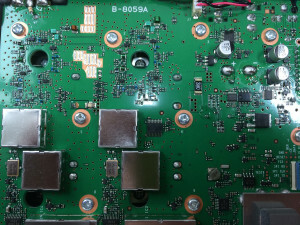 The upper 3 diodes need to be removed in order to gain “full functionality”. The left picture shows the standard configuration for an IC-5100E that is intended for german use. 3 -> TX 70cm ext. 14 -> TX 2m ext.